Many galaxies are visible in the field of view of this cosmic vista and three are particular noteworthy. 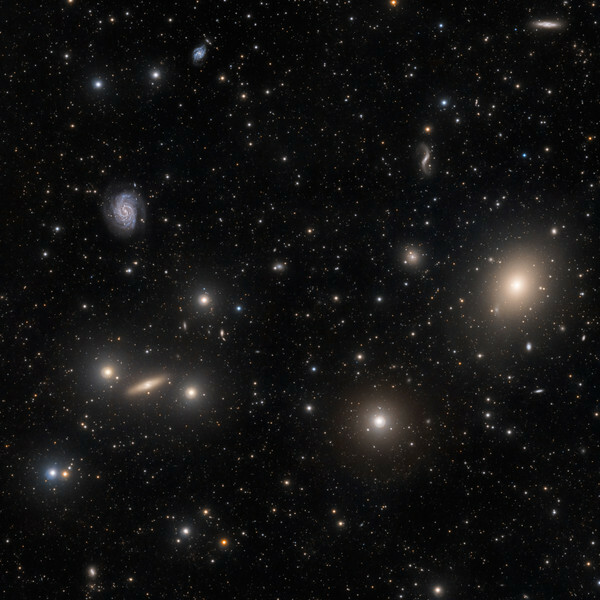 M49, at right in the image above, was the first member of the Virgo Cluster of galaxies to be discovered by Charles Messier in 1771. With a magnitude of 8.3 and located about 50 million light-years away in the constellation of Virgo, M49 is supposed to have a supermassive black hole in its nucleus with an estimated mass 565 million times the mass of the Sun. This galaxy has a large collection of globular clusters, estimated at about 5,900. Barely visible around M49 is a faint extended, interleaved shell system reminiscent of the radial accretion of a satellite companion, discovered only in 2010. NGC4526, at left in the image above, is a lenticular galaxy with a magnitude of 9.6, located in between two relatively bright stars that makes it an easy target to be spotted visually. NGC 4535 is the bright spiral galaxy above NGC 4526. It was discovered in 1785 by William Herschel that described it as an easy object and at 9.8 has a similar magnitude of the latter. Due to the relative brightness and close location to M49, it is surprising how Messier missed these two galaxies, hence the nicknames of "lost galaxies".